Everyone at your brunch table will “holla” for this dish. It’s like eating cake for breakfast, but healthier. 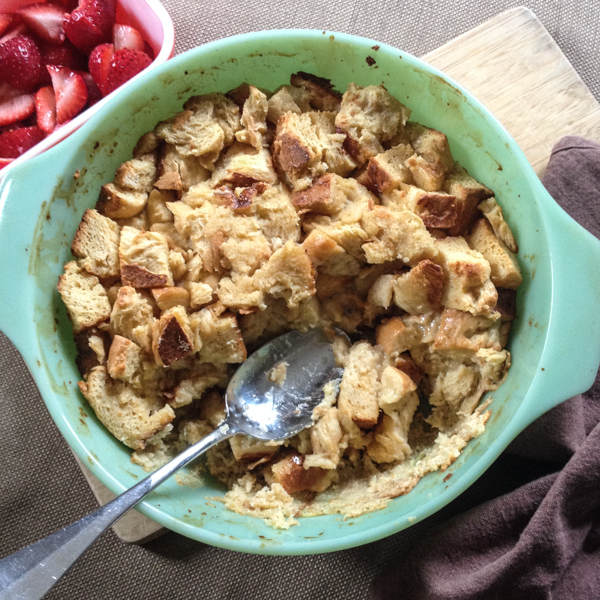 I modified this Serious Eats Challah Bread Pudding to achieve the following awesomeness. Preheat oven to 350 degrees. Cube the stale bread or dry out cubes in preheating oven. In a large bowl, blend eggs, and add vanilla, sugar, salt and milk. Grease 2-quart lidded baking dish. Mix half of bread cubes with half of egg mixture. In the large bowl, add remaining bread to remaining egg mixture. Allow bread to stand for several minutes to soak up liquid. Once liquid is absorbed, dump contents of large bowl into baking dish and mix together. Place lid on baking dish and bake for 20 minutes at 350. Uncover and bake another 15-20 minutes until edges brown. Edges will be firm and crunchy while center of challah bake will be soft and gooey. Admit it. You’re salivating already, aren’t you? It’s cool. Just wipe the drool off the keyboard and get cooking. You haven’t any challah, you say? No excuses. Make it now. How do you French toast? Do you prefer yours crispy through and through, or do you like a little squish?